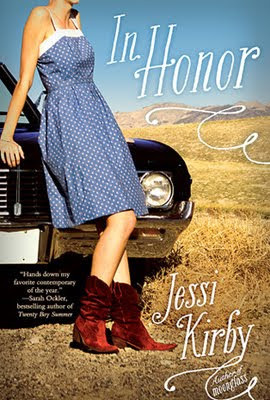 For all those who lost someone in Iraq and all those who don’t even know someone who fought it in, get a glimpse inside military family with GCC Member Jessi Kirby’s new book, IN HONOR, out this month through Simon & Schuster Books For Young Readers. Grief-stricken and determined to grant Finn’s last request, she rushes to leave immediately. But she only gets as far as the driveway before running into Rusty, Finn’s best friend since third grade and his polar opposite. She hasn’t seen him in ages, thanks to a falling out between the two guys, but Rusty is much the same as Honor remembers him: arrogant, stubborn. . . and ruggedly good looking. Neither one is what the other would ever look for in a road trip partner, but the two of them set off together, on a voyage that makes sense only because it doesn’t. Along the way, they find small and sometimes surprising ways to ease their shared loss and honor Finn–but when shocking truths are revealed at the end of the road, will either of them be able to cope with the consequences? Jessi: I’ve only been a bridesmaid twice, and both dresses were cute! I lucked out, I guess! Jessi: In IN HONOR, I based a minor character named Bru on an actual jeep tour guide I had on my research trip to Sedona, Arizona. Q: Let’s talk publishing. What was harder for you, finding an agent or an editor? Jessi: Finding an agent was harder. I queried many agents and got many rejections, but once I had representation, things went very smoothly. Jessi: I wanted to write a story about the relationship between a brother and sister, and I wanted it to include a road trip. The idea of the letter and Honor’s ensuing trip evolved from there. Thank you, Jessi! Now, everyone go out and buy books, lots and lots of books!